The liquid also evaporates causing the vapour (gas) pressure to increase. The critical point is where the density of the liquid matches that of the vapour. Above this ‘critical’ temperature and pressure, the substance forms a single fluid with no distinct liquid state. In the movie you can see that the meniscus at the top of the liquid just gradually disappears – there is now no ‘surface tension’. At the critical point, the density of the fluid is typically one third of the liquid density at atmospheric pressure. Because there is no difference between liquid and gas, the latent heat associated with evaporation (when molecules move from the liquid to the gas) and condensation (when molecules move from the gas to the liquid) falls to zero. Critical Opalescence can be seen when cooling just below the critical temperature. The random motion of the molecules in the fluid causes some regions to transiently have densities that are slightly greater than the average (more typical of the liquid) – and others to have densities more typical of the gas. Because the latent heat and the surface tension are very close to zero, these microscopic fluctuations can grow dramatically. Spontaneous fluctuations can cause regions as large as a thousandth of a millimetre – containing thousands of billions of molecules -to fluctuate into and out of the liquid state – forming droplets. Although the difference in density (and hence refractive index) between the liquid droplets and the gas is tiny – it is just enough to scatter light – like a fog – a phenomenon which someone poetically named ‘opalescence’ rather than fog. Critical Opalescence is mentioned in Physics course, but it is rarely seen. The high pressures involved (more than 73 atmospheres in this case) present a hazard that few people are prepared to tackle. I suspect that students at Dalhousie may not appreciate how lucky they are! P.S. It turns out that carbon dioxide above its critical point is an excellent non-toxic solvent for caffeine and so when you sip your de-caff latte tomorrow – you can now imagine the physics that describes the fluid which took away the caffeine. Critical Opalesence observed in a binary liquid system. What is happening? And what is the relevance to the early Universe? Phase changes – the changes from solid to liquid or liquid to vapour – are amongst the most astonishing phenomena in nature. However, because they are familiar to us, we sometimes fail to notice just how amazing they are. But consider this: water molecules with one level of molecular jiggling form a solid so hard that it can rip apart the metal hull of ship. But if their average energy is increased by just a small fraction of one percent, the same molecules will form a liquid and the ship will be quite safe. Critical opalescence is a phenomenon associated with a phase change which you will almost certainly not have witnessed. It occurs when a liquid at room temperature is sealed in a strong container and heated. Some liquid evaporates filling the space in the container. As the container is heated further, more liquid evaporates, increasing the vapour pressure. The density of the liquid falls as it expands and the density of the vapour increases and eventually a point is reached where the density of liquid and the gas are equal. At this point there is no way to tell which phase is which and the container is filled with ‘fluid’. Even though both liquid and vapour are transparent, as one approaches the critical point, the mixture becomes cloudy – a phenomenon scientists ‘big up’ and call critical opalescence. It is a consequence of the fluctuations that are always taking place at the molecular scale. A few molecules at a time jiggle around and ‘try out’ new ways of sticking together. For example small numbers of molecules in the liquid phase ‘try out’ being in the gas phase. If it turns out to be lower in energy then more and more molecules join them and a large-scale phase transition takes place. As the energy required to change from liquid-to-gas (latent heat) become smaller and smaller – reaching zero at the critical point – the number of molecules able to take part in these fluctuations grows. The opalescence occurs when the size of the fluctuations involves around a billion atoms – in droplets with a typical size of roughly 0.000 3 millimetres – roughly the wavelength of light. Then droplets of liquid constantly form and disperse, scattering light from their surface even though liquid and vapour are both transparent. This is similar to the way in which fog is opaque even though water and air are both transparent. Anyway you will almost certainly never get to see this phenomenon in a liquid-gas system, but critical opalescence may be observed in a much simpler way: in a mixture of methanol and hexane. Below 39 °C these organic solvents separate into immiscible phases, but above that they form a single phase – analogous to the phase separation in the liquid-gas system around its critical point. Cooling the mixture after heating above its ‘critical point’, the opalescence is easily observed. Below is a compilation of still photographs of the phenomenon in the form a movie, and technical details of how to do the experiment. And you might think that would be it – a cute trick. But in fact this demonstration shows two astonishing things. Firstly, it is direct visible evidence of the dynamical nature of fluids and the importance of microscopic fluctuations in phase changes. This underlies the detailed dynamics of every change of phase, explaining why things do – or don’t – supercool or superheat. Secondly, the universe itself is thought to have undergone an analogous phase transition in the first instants after the Big Bang. Our search of the heavens for the fluctuations in the intensity of microwave radiation is a search for the remnants of similar fluctuations to those which you can see in the methanol/hexane mixture. Wow! The Universe in a glass of solvent! Phase transition is the technical term used to describe phenomena such as the melting/freezing of ice/water, or the evaporation of a liquid to make a vapour. Just below the temperature at which ice melts, it is a solid, and in most senses of the word, there is no liquid present at all. Just above the temperature at which ice melts, it is a liquid, and in there is no solid present at all. Raising the temperature by just a few thousandths of a degree is sufficient to transform completely the properties of water-substance. Transitions such as this are called first-order. Not all phase transitions proceed in this way. For some transitions there is a critical temperature below which some kind of structure or order begins to appear. That is, just below the critical temperature TC the structure or order is not fully developed, but in some sense ‘grows stronger’ as one proceeds below TC. Thus both phases co-exist just below TC with the low-temperature phase growing stronger the further the temperature is lowered below TC. These phase transitions used to be called second-order, but are now known as continuous. The most common example of a continuous phase transition is the liquid/vapour system. Consider a volume filled with vapour at constant pressure. This might correspond to vapour trapped in a very loose balloon. For the sake of definiteness let’s assume that we have water vapour and that there is no liquid water present in the container. As one lowers the temperature, the density of the vapour increases. Eventually one reaches a point where some liquid condenses. Both liquid and vapour co-exist, but the amount of liquid increases as the temperature is lowered below this condensation temperature. But even well below TC, there is still vapour present above the surface of the liquid. Above TC for a continuous phase transition, the substance is constantly fluctuating into a state which is close to the new state which will eventually take over at lower temperature. These fluctuations are generally confined to just a few molecules at a time and take place on the length scale of a few nanometres. However as one gets closer to the transition temperature, the ‘stability’ of the two phases (technically: their specific Gibbs Free Energy) becomes closer and the random fluctuations grow larger both in their physical extent and the length of time over which they last. Eventually the length scale and the time scale become so large that the system simply fluctuates into the new phase. TC marks the temperature at which length scale and timescale of the fluctuations diverges. To appreciate what the critical temperature indicates in a liquid-vapour system, consider the case now of liquid water heated in a closed container. As the temperature of the container increases, the density of the the water falls (slowly) and the density of the vapour rises (rapidly). If the volume of the container is chosen so that all the liquid does not evaporate, at some point the densities of the liquid and vapour become equal. For most fluids this occurs when the liquid density is around one third its “normal” value. For water this corresponds to a pressure of around 220 atmospheres and a temperature of 647.3 K (374.2 °C): the critical temperature of water substance. At this point there is no distinction between the dense vapour and the low density “liquid” and so there is no latent heat associated with the transition. Both are just matter in a fluid state. Near this point there is only a small distinction betwen the between the dense vapour and the low density “liquid” and the latent heat becomes smaller and smaller as one approaches TC. On a microscopic scale, the molecular randomness cause a liquid near TC to constantly fluctuate into nearly vapour-like volumes and back again. As one approches TC the length scale of the fluctuations grows. This is because the energy required for a fluctuation into the vapour state becomes smaller as one approaches TC. Eventually the fluctuations occur on the scale of a fraction of a micron: i.e. of the same order as the wavelength of light. If there is a difference in refractive index of the vapor and liquid phases (and there is generally a small difference) then light will be strongly scattered and the mixture of the phases appears cloudy. This phenomenon is known as critical opalescence. However the critical points of all practical substances occur at pressures of above 10 atmospheres and so require special safety precautions to observe. As mentioned above, the pressure required for water is greater than 200 atmospheres.The combination of high pressure and glass windows is generally a troubling one. Some binary fluid mixtures also show a critical temperature. Above TC the fluids are miscible, but below TC they separate into two separate phases. As one cools a binary fluid towards TC from above, the fully-mixed phase is constantly fluctuating into phase-separated volumes and back again. As one approches TC the length scale of the fluctuations grows and eventually reaches the scale of a fraction of a micron: i.e. of the same order as the wavelength of light. As with the liquid vapour systems, light will be strongly scattered and the mixture of the phases appears cloudy. This critical opalescence is exactly analogous to that seen in liquid/vapour systems. One can imagine that one of the fluids (e.g. in our case the hexane) is a vacuum. The methanol “evaporates” into the vacuum. Since the volume of the hexane is fixed, as the temperature increases, the density of the methanol “evaporated” into the hexane equals the density of the methanol “liquid”. This marks the critical point of this system. The analogy is complicated because simultaneously the hexane is “evaporating” into the “vacuum” of the methanol, but the basic analogy between the binary fluid system and the liquid/vapour system is sound.Thus binary fluids allow one to observe critical opalescence, with negligible safety risks. And of course, observing it on the web your safety risk is reduced still further :-). The demonstration is described in the book The Theory of Critical Phenomena by JJ Binney, NJ Dowrick, AJ Fisher and MEJ Newman, published by Oxford University Press in 1992 ISBN0-19-851393-3. It involves mixing hexane (C6H14) with methanol (CH3OH) in the ratio such that ratio of the number of molecules is 665:435. Using the data for the density and molecular weight it can be shown that this corresponds to a volume ratio of 1 to 4.93. Data from Kaye and Laby. The book specifies the use of n-hexane rather than just hexane but I found using regular hexane made no difference. I mixed the liquids in the ratio 20 cc methanol to 98.6 cc hexane. The precision required did not seem to be too great. The photographs on this site represent my second attempt at the experiment and my only tip is that observe it is important to keep the container still as it cooled. 1. Picture taken after mixing hexane and methanol at = 18 °C. The liquid-vapour boundary is at the top the picture and the phase boundary between the lower methanol-rich phase and the upper hexane-rich phase is visible about 1/4 of the way up the picture. The silver “blob” in the centre is a thermometer. 2. Now the liquid has been put onto a hot-plate and heated to around 30 °C. Notice the presence of so-called capillary waves at the interface between the two fluids. The waves are very persistent and move slowly around the container giving a kind of “slow motion” effect. 3. Still on the hot-plate the liquid has now reached 45 °C. The liquid appears to “boiling” but it is not: 45°C is well below the boiling temperature of both liquids (64.7 °C and 68.7 °C for methanol and hexane respectively). What is happening is that one phase is “boiling” into the other. Indeed, just before this picture was taken, small jets of the lower (hotter) methanol-rich phase could be seen exploding into the other! 4. Now the flask has been removed from the hot-plate and is being held in a clamp stand and allowed to cool. It is at about 46 °C. 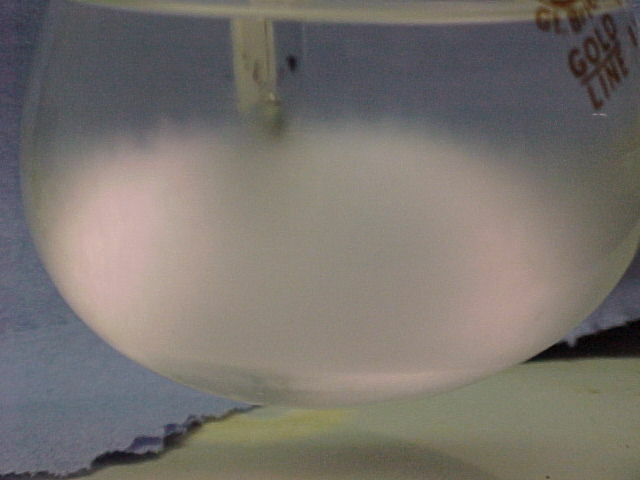 Notice that the liquid is clear (compared with Picture 3) and that the phase boundary visible in Picture 1 has disappeared. This is the high-temperature mixed phase. 5. Now the flask is continuing to cool and the nominal temperature is about 46 °C. Notice that the liquid is becoming cloudy at the bottom of the container. Due to convection, the bottom of the container is probably the colder than the top of the container by a few tenths of a degree celsius. 6. The flask is continuing to cool and the nominal temperature is about 41 °C. The cloudiness is now much more noticeable and reaches further up the container. With “the eye of faith” one can just begin to see the methanol-rich phase collecting at the bottom of the container. 7. The flask is continuing to cool and the nominal temperature is about 39°C. The cloudiness is now much more noticeable and reaches further up the container. The methanol-rich phase may now be more clearly seen at the bottom of the container. 8. The flask is continuing to cool and the nominal temperature is about 37.5°C. The cloudiness now reaches further up the container. The methanol-rich phase may now be clearly seen at the bottom of the container and a reasonably clear phase boundary is visible. 9. The flask is continuing to cool and the nominal temperature is about 37°C. The cloudiness now reaches its maximum extent. The methanol-rich phase may now be clearly seen at the bottom of the container and that too appears to be cloudy, but it is difficult to be sure. 10. The flask is continuing to cool and the nominal temperature is about 36.5°C. The cloudiness is now beginning to clear. 11. The flask is continuing to cool and the nominal temperature is about 35.5°C. The cloudiness is now definitely clearing. 12. The flask is continuing to cool and the nominal temperature is about 33°C. The cloudiness continues to clear and one can now (just) see droplets forming on the glass. These droplets are on the inside of the glassware and form in both phases. Those in the upper hexane-rich phase drip down to interface, but the drops in the lower methanol-rich phase drip upwards to the interface! 13. The flask is continuing to cool and the nominal temperature is about 28°C. The cloudiness is nearly gone and one can now clearly see the droplets described in Picture 12. 14. The flask is continuing to cool and the nominal temperature is about 26°C. The cloudiness is nearly gone and the droplets described in Picture 12 are clearly visible. 15. The flask is has now been left for one hour since picture 14 was taken and its nominal temperature is about 18°C. The cloudiness is nearly gone and the droplets described in Picture 12 are still clearly visible. Phase separation is essentially complete and the system has returned to its equilibrium state similar to that visible in Picture 1.